Designed to help you establish strong roots for your hydro crops. Just seed, feed and grow. 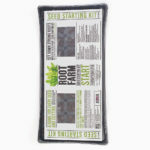 Our seed-starting plugs contain a sponge-like peat moss material. Unlike seed-starting potting soil, these plugs do not contain any loose particles that could potentially clog tubing or pumps in a hydroponic system. 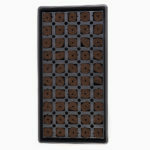 Peat moss based plugs and included planting tray are designed to provide a strong start for your seeds and cuttings. Plugs can be easily transplanted into your hydro garden. Can be used to grow a variety of plant types, such as tomato, pepper, and cucumber. Kit includes 50 seed-starting plugs. Includes a self-watering tray to keep plugs moist for seedling development. When roots appear on the outside of the plug, your plants are ready to be transplanted. If needed, soak plugs in water or low-strength nutrient to rehydrate. Once planted, place tray in a South-facing window or under a cool white fluorescent light. When roots have developed and can be seen growing outside of the plug, transplant the plug into your hydro garden.